Gone are the days when skinny models set the standards for good looks. Curvy girls are making a big comeback. No one knows this better than plus-size dating sites that are full of people looking to meet and have fun with big beautiful women. 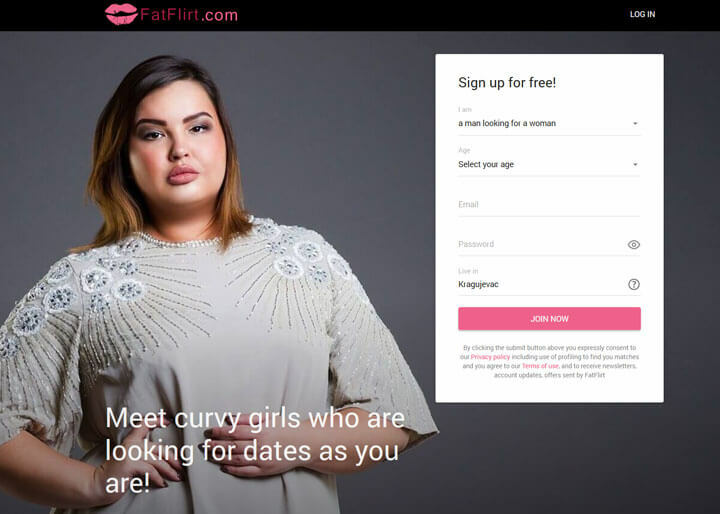 One of these sites is FatFlirt – a plus-size dating platform that is quickly gaining popularity in this segment of the online dating world. Read our FatFlirt review to find out all you need to know about this exciting dating service that may help you find a perfect chubby match in your area. FatFlirt has a simple and straightforward registration procedure. It literally takes only a minute and you’re ready to upload your profile photo. If you choose, you may also add a video and details about your ethnic origin, hair color, body type, orientation, height, weight, education, smoking and drinking habits, and more. Once you are done, your search for the perfect chubby companion can begin. FatFlirt features a very nice and user-friendly interface. All the elements are arranged in a logical fashion, which means that even the most inexperienced user won’t have trouble using the site. It is worth noting that this dating site is very well optimized so there are no annoying delays when you’re opening pages and searching through the member base. The color theme is pleasing to the eye and notifications are clearly visible so you’ll never miss them. Overall, the creators of this dating site have done a really good job and their efforts result in first-class user experience. When it comes to features, FatFlirt offers all you can expect from a premium dating platform and it has some special options that you can use to make your plus-size dating even more enjoyable. We are glad to see that even non-paying members can use almost all the features, which makes this dating site highly attractive. First of all, FatFlirt allows its users to search through the member base using various criteria such as age, location, orientation, ethnicity, body type, and even hair and eye color. You can limit your search to new members or those who are online at the moment. Alternatively, you can choose to see only those profiles that contain a photo and/or video. Like Gallery is a useful dating tool that allows you to store profiles of all the members that you find interesting and to see who’s liked your profile. Of course, you have the option to communicate with potential matches via instant messages. In your profile settings, you can choose which notifications you want to see. FatFlirt also offers you the possibility to promote your account so that you can be seen by more people and get more interaction. Some of the communication options, like the ability to get read receipts of all your messages, are reserved for paying members. Paying members also have the option to activate incognito mode so that they can browse profiles anonymously. Users who choose to upgrade to a paid membership also get the benefit of extra security. It is important to mention that FatFlirt offers a very nice mobile version of its site, which is great news for all singles who prefer to use their cellphones for online dating. Lastly, this dating platform also offers some useful tips for safe dating. FatFlirt is undoubtedly a great place to meet big beautiful women. The member base is filled with open-minded individuals who are ready to flirt and have fun. Whether you prefer casual interactions or want to make lasting connections, FatFlirt is an excellent platform that will allow you to get the best out of plus-size dating. Finding interesting chubby singles in your area has never been so easy. FatFlirt is a user-friendly platform that will make your pursuit of a perfect chubby companion highly enjoyable. We strongly recommend that you join this plus-size dating site and take advantage of the numerous exciting features it offers. Try it! After all, you have nothing to lose and chances are you’ll have great fun finding that special someone. Great place to be if you want to have some fun. I met some very cute ladies. I enjoy using this site. It has some good features.